Outside the OR in scrubs, waiting to be called in. The role of a birth doula is quite simple, yet versatile. Breathe, encourage, massage, listen, serve… There’s not a whole lot of non-medical support tasks that a doula won’t do. Our main goal is to fully support the birthing mom, alongside her partner, by helping to create an atmosphere that accommodates the birth goals and experience the mom is looking to achieve. The ultimate end goal of a doula is a supported mom and partner. While it has been most common that doulas are hired by women looking to birth in a low intervention environment, the tides have changed. The use of a doula has been found to be applicable in all birthing scenarios. More and more women are hiring doulas even as they plan for an epidural, medical induction, or even a cesarean birth. It’s not that the spouse, mother, sister or nurses aren’t enough. That’s not the case at all! It is that there is something invaluable about having a personal advocate who is educated and trained, who can be objective and supportive. Family members often find it hard to be objective when their loved one is in pain. While expectant women may have read every pregnancy book and website recommended; most women will report that in the moment of decision making, exhaustion, and discomfort, they forgot nearly everything they studied. A question is often also asked about whether the nurses can fulfill the role of a doula. The nursing role is to be a patient advocate, and as part of that role they provide emotional and physical support. They also fulfill an important medical role that doulas are not qualified or trained to do. However, many times the birthing mother is not a nurse’s only patient; and so the nurse cannot be dedicated to providing continuous emotional, physical, and medical support to just one person. That’s the beauty of a doula. A doulas is your personal helper that you handpick for yourself. She is objective, educated, trained; has experience in different birth settings and scenarios; and will remain with you from start to finish. We can’t make decisions for you, and we definitely can’t perform medical tasks; but we can coach you, encourage you, and offer you guidance through your birth so that you feel like you made educated and informed decisions to achieve the birth you desired. Sometimes birth doesn’t go as planned, and emergencies happen. Cesarean births are now the most common procedure performed in US hospitals. 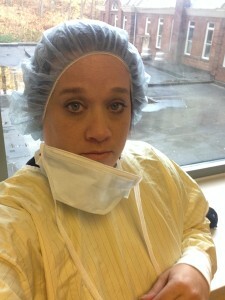 So how does a doula work in the OR? Why would one belong in there if they are a non-medical support person? I will tell you truthfully – up until recently, my answer may have been more apathetic. But about 6 weeks ago, I attended a cesarean birth that I will never forget. It was a planned surgery. The baby was transverse in presentation and so we knew going in that if the baby hadn’t moved, there was no hope for a vaginal birth. Both the obstetrician and the anesthesiologist were happy to have both myself and the baby’s father attend the birth in the OR. This is not very common in our area – but we were all glad that everyone was in agreement. The medical staff wheeled the mom into the OR. Her husband and I put on our gowns, masks, hats, and booties; and waited for them to get us. As we entered the OR we saw the mom laying on the operating table, and her arms stretched out. The medical staff placed two small stools to the right of her head where her husband and I sat while we waited for the baby to be born. At this moment the mom was in pain. She could feel tugging, pulling, and pressure; and she was visibly upset. Her husband whispered encouragement to her as I held her hand. Within a few minutes the baby was born! The mom was able to have skin to skin contact with her baby for almost 20 minutes, which is something I have never witnessed in the OR before. I pause here and reflect on this precious time because so many cesarean births do not offer this significant opportunity. Research shows that the first 2 hours of a baby’s life is a time where the baby is very aware of the mother – taking in her voice, smell and making meaningful eye contact. This makes this time a very important bonding time. Many women who birth via cesarean section have missed some, most, or all of this vital time; and it often results in mothers feeling sad, unfulfilled, and regretful. So, for me, witnessing this moment was beautifully epic! About 20 minutes after birth the mom was in a lot of pain. This was the same time the dad went with the baby to the nursery, where he was able to continue skin to skin until the mom was moved to recovery. This is where I really came into good use! The mom needed significant encouragement and support through the pain and fear she was experiencing. She knew me and felt comfortable with me. I spoke encouraging words to her; brushed her brow with a cold cloth; held her hand; and when the moments were just right, would crack a personal joke or two to take her focus off her fears. I stayed with her throughout the entire time in the OR. I can’t say enough about how grateful I am that Danielle was a part of my birth experience… I felt so grateful to have someone so supportive and experienced to go through the journey with me. At my c-section, both my husband and Danielle were allowed in the OR. I didn’t think I would “need” a doula with me during a short surgery, but after my husband left with the baby, I experienced a considerable amount of pain and fear for the next hour that I wasn’t expecting at all. …I’m so glad I was able to have her with me during this time in my life. Her sense of humor, warmth, strength, and birthing knowledge were invaluable to me. Everyone in the OR was needed, and their jobs were done best when they fulfilled their specified roles. I am glad to see more OB’s recognizing the benefit of allowing doulas in the OR. I firmly believe that any birth – natural or medical – outcome is improved when the mom feels completely supported. That’s what doulas strive for! It’s what they add to the birthing environment and team. Sounds like a win-win situation to me! Congratulations A & C! Story and photos used with permission.